RIP, Larry...and thanks so very much for all the memories. Viewing in the Fireside Room : 12:45 p.m. to 1:30 p.m. Sorry to hear about Larry's passing. He was a great guy and fun to fish with. Bernie and I had the privilege of fishing with him in Alaska a couple of times. He fought hard to keep on living and lived longer than they expected him to. May the good Lord welcome him with open arms and put him close to that heavenly river! I'm sure it must have some fish in it. pops (Carl Buckle). A hero to me, I waited for his show every week. RIP and thank you for all the memories. Heck of a nice guy. He influenced many lives in a positive way. His impact was huge. From his stores, to his tv show. He will be missed greatly. A great guy. Will be missed by many. If it had not been for Larry, we would have never experienced the 6 great years in Alaska. He made it happen. Thanks Larry and Rest in Peace! Many great memories watching Larry's show each week with with my dad as I grew up. We always looked forward to each new adventure and episode. RIP...What more can I say for a man that was a role model for young men. Unknown to him he steered many of young men away from trouble and turned them on to hunting, fishing, and other sports programs that he sponsored. Hope his family is as proud of him as I am to just know him. 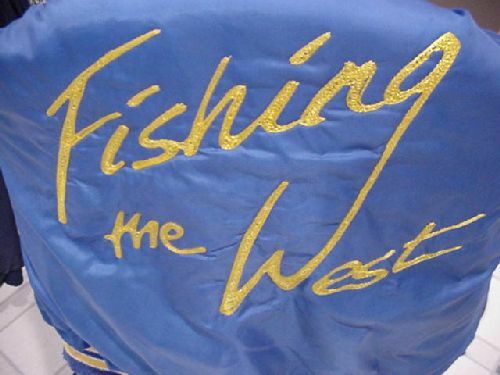 Thanks to a posting on this very site I was reintroduced to Fishing The West only two weeks ago after not seeing footage since I was a kid. It's just as relevant today as it was then. Like many of you, I watched his show every week and visited the Oregon City store often. While I never met him, his passing saddens me as though he were a childhood friend I somehow lost touch with. I wish I could have shook his hand and thanked him for the impact he made on my life and for the memories he helped create with others I love and miss. Thank you Larry. Rest in Peace. I would suspect that his funeral will be a Who's Who of the fishing and outdoor world. I'm sure there will be some outstanding stories to be shared among his family and friends. Thanks for sharing the adventure Larry!! I think. You were a great guy to spend the day with. Team - "Catch and Release"
Fishing the West and Larry captured my attention when I was a kid. Not having parents that fished and no lakes or rivers near our home, it was STS and Fishing the West that taught me when I was young. His store employees helped hone my interest in the great outdoors. Larry and his efforts to our passion here in the NW helped to mold me into the person I am today. Thank you Larry. Rest in Peace. Because 90% of the fish are in 10% of the water! One of the highlights of my fishing youth was when I got to meet Larry at his store and talk with him for a while...I was just getting into steelheading. It was very memorable, very nice guy. Took my first trip ever to Alaska through Larry's Travel Service. Went back 4 times since his recommendations were so spot-on. A legacy in our world for certain. Thanks for the memories and inspiration!!! You and me both John! Except, I was a little older. Thunderjet Luxor Offshore "Double Sea"
I have great memories of watching Larry's show, Fishing the West, as I grew up. RIP! RIP Larry, I will miss our talks at the Sportsman show. Larry had time to talk to anyone no matter what! Sad, cancer is awful. RIP Larry. RIP Larry. May God's rivers in Heaven be filled with feisty fish and tight lines for you. Take a kid hunting or fishing. Thanks for taking us to all those special places and showing us all those pretty fish ! What a great loss to our sport. We watched his show every weekend and taped most of them for reference. He always took the time to talk to the kids at the sports show or when he had his stores. Fishing is meant to be a peaceful way to spend the day, enjoying the outdoors and the people you are with and around. Please keep it that way. He was local, and he conveyed his love of the great northwest to the rest of us. And he had a great store where we could get whatever we needed to enjoy it. He lived a great life.....sorry that he is no longer with us. Always was entertained by his show & bumped into him a few times on local rivers & he was a true enthusiast & well spoken on our sport. First class guy in my book and certainly enjoyed fishing with him. You will be missed my friend. Ethel, if you are reading this just wanted ya to know we will pray for you and your family during this time of reflection. Larry was a wonderful man and I always enjoyed his phone calls. Very sad...cancer just keeps on going. RIP, Larry, and many tugs on your line. He sure did help the ODFW budget. Many a license sold because of him. Like many I will miss chatting with him at the Sport Show. Larry was a class act, a lot of fun and loved fishing. He could tell a story with the best of them and they were always very enjoyable. He will be missed. Condolences to all and have a safe journey. Igrew up watching FTW. I was able to meet him at the Ceder Hills store. Very sad he passed. RIP Larry. very sad - great loss - he touched all of us - knew him from his first store ( his original store in OC shopping center ) in the late 60's. go fishing while you can - a lot of us are of that age. RIP Larry! I always think of the 'Larry's" days when I go into O.C. Fishermans.Larry was always on the floor selling and giving advise.Great Guy! Brings a tear to my eye. As a little kid I watched his show and loved it, really got me excited about fishing. Just a few years ago I got to talk to him and man what a nice guy. Thanks Larry. Only wish I could of went fishing with him, maybe someday. I bought my first "good" steelhead rod from him at Cedar Hills store. And he let me buy it on layaway. $125.00 was alot of money back then. He was in short one hell of a good guy. Life is Tough. It's Tougher when you're Stupid. Larry No doubt was an Icon in the PNW. Most folks who hunted and fish and even those who didn't would watch his show on Sunday evening. I would leave my friends and drop what I was doing to get inside to watch the latest episode or even a Re-Run. I hope CSNW or FSNW will step up and give us a year or so of Larry. I would Love to see every episode again, not just the best of, but everyone. As people get off work and sighn on to Ifish and read about the passing of this great outdoorsman they will all reflect in some way on how Larry touched there life, I still use some of Larry's one liners on my boat today. Hope to fish with you in the distant future Larry. He will be missed! A true gentleman, a heck of a salesman, and an all around great person. I worked for Larry back in the 70's and I still have the Gerber knife set he got me for my wedding present.